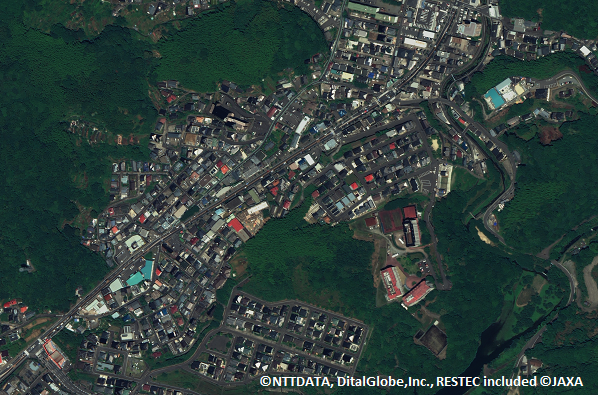 high-resolution images of any location on earth; imagery is taken with the sophisticated satellite constellation operated by DigitalGlobe and JAXA, then orthorectified using AW3D standard/enhanced data as DEM source. Created from 30 - 50 cm resolution images from the satellite constellation operated by DigitalGlobe. 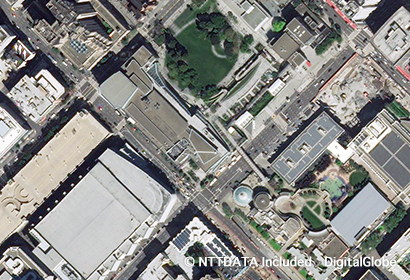 You can clearly count a person, or a white strip of a crosswalk, for example, in a 30 cm resolution imagery. Using AW3D Standard (5m) DSM, high positional accuracy and global coverage DSM, as the reference DEM in the orthorectified process. AW3D Enhanced DSM, which has higher positional accuracy, can be used per your request*. In this case, we can provide a greater area of ortho images which are equivalent to scale 1:5,000 ~ 1:25,000 maps in short turnaround time. In addition, we can offer ortho-images equivalent to scale 1:2,500 map from our latest and the highest positional accuracy satellite imagery archives if you can share your ground control points (GCPs) data. *both AW3D Ortho and AW3D enhanced have to be purchased as a package. *Other formats are available on request.